I will be teaching a 4 hour workshop (1-5pm) on Sunday, September 16th on Ending Internal Conflict at Best Martial Arts Institute in Eugene. We’ll be practicing self inquiry in motion through a variety of drills and exercises. The workshop will be an active exploration of internal states and their relationship to breath, movement, martial arts, and everyday action. The Workshop is open to practitioners of all martial arts and non-martial artists alike. No prior experience is necessary. The contents are intended to help anybody understand themselves better, see more clearly, resolve conflicts, and experience the unification of mind and body. This work is for anyone who wants to develop effortless, spontaneous applications and pursue insights into the spiritual aspects of training, whatever their art or focus may be. See the flier here with detailed information, and please share it with anybody who might be interested. The aim of this workshop will again be to go deeper into the work understanding internal awareness and control. There will be some martial arts components, but all the work will be very soft, with a focus on movement. The primary work will be internal, combining aspects of meditation, movement, massage, and breathing. As I see it, the fundamental work of Systema is to understand oneself by quieting and clarifying the mind and body. This work is not only the basis upon which any martial applications can be built, but is also the basis upon which one can approach martial arts as a spiritual practice. As a background to our training endeavors, you can again read my thoughts on the subject here: Martial Arts as Spiritual Practice. Let’s train for victory over oneself and to become the universe itself. It’s not as crazy or as far off as it may sound. I am returning from out of town travel today and due to delayed flights, it looks like I won’t be making to Eugene until very late or tomorrow. Under the circumstances, Systema class will be cancelled tonight (6/25). Apologies for any inconvenience. I hope you all get the message. Spread the word if you’re in contact with anybody who might miss the email for this post. Hope to see you all next week. I’m looking forward to a great weekend of training and seeing friends. On Saturday, I’ll be at the Pacific Martial Arts Conference (Pac MAC) at Best Martial Arts Institute for an incredible lineup of teachers. On Sunday, I’ll be teaching a four hour workshop on mind body awareness, also at Best Martial Arts. Pac MAC is one of my favorite events of the year. If you’ve never been, don’t miss out on this incredible opportunity to learn new perspectives and train with new people. Throughout the day, ten instructors from different martial arts will be teaching 25 minute classes, with 5 minute breaks between. I’ll be teaching a segment in the afternoon. Hope to see you there! The aim of Sunday’s workshop will be to go deeper into some fundamental work understanding internal awareness and control. There will be some small martial arts components, but all the work will be very soft, with a focus more on movement than martial elements. The primary work will be internal, combining aspects of meditation, movement, massage, and breathing. It is, as I see it, the fundamental work of Systema to understand oneself by quieting and clarifying the mind and body. This work is not only the basis upon which any martial applications can be built, but is also the basis upon which one can approach martial arts as a spiritual practice. And on this subject I’d like to offer the following thoughts. You can download and read a PDF here, or read on below. When we get involved with martial arts, or any activity, we are already starting with a lot of assumptions, ideas, and even fantasies about who we think we are, what we’re doing, and why. Nevertheless we are setting out upon a journey. However, although we may think we know who we are and where we’re headed, we don’t. We really don’t know. But if we continue on this journey with a sincere intent to understand something beyond what we think or believe, then, and only then, our practice can take us someplace we never imagined. The journey progresses with an inquiry into everything, a questioning that extends to every aspect of ourselves, our experience, and the world around us. And within that lies the discovery of our own fear, our aggression, our selfishness, our desires, our anger, our arrogance, our ambitions, and our pain. Soon, what may have started out as a way to acquire a skill, to attain knowledge, or to better ourselves, becomes more a matter of just dealing with ourselves. And we struggle to let go of our fear, our aggression, our selfishness, our desires, and so on. Ultimately, this journey requires letting go of everything all at once, including ourselves. It requires not only an unreserved acceptance of one’s life, but also of one’s death – not as a future event, but as a present reality, that is always here and now. It requires complete and total surrender. This is the path to enlightenment, and it ends with a realization that lies beyond all limitations, beyond all thoughts, and beyond all concepts. Wherever you are on this journey, and whatever you may think of all that, what we’re talking about is not a matter of self-improvement, nor of strengthening any personal spirit. Unfortunately for our egos, it’s more a matter of letting go of this person, and of recognizing the undifferentiated spirit that is everything and everyone. To train like this is not to engage in so-called “spiritual” martial arts, as if it were somehow an upgraded or more moral version of regular martial arts. That is the wrong way of looking at things. Instead, it is to engage in martial arts training as a spiritual practice, with the intention of inquiring into the truth, of understanding yourself, of seeing clearly, and of letting go of the unreal, the untrue, and all selfish attachments and desires. 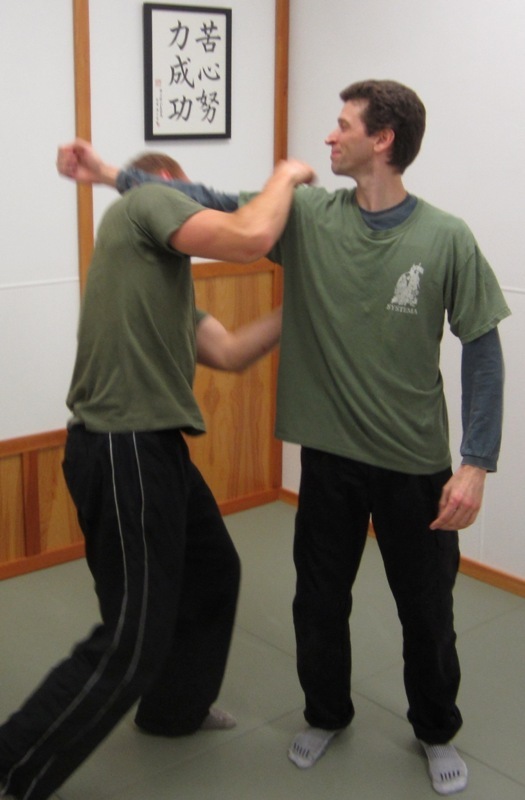 Ultimately, martial arts as a spiritual practice is not about peaceful people learning how to cope with violence. It’s about violent people – people who are already in conflict with themselves – learning how to cope with peace. Our present window into this endeavor is mind body awareness. Mind body awareness can be thought of as more than just a study of the mind and body, or even of their coordination. It is also a study of awareness itself. And it is a study of these things on the most fundamental level. It is to ask: What is it that I am experiencing? What is this mind? What is this body? What is this awareness? And who is it that is aware? You probably already have some assumptions, some ideas, and some beliefs about these things. So my advice for training is this: Whatever you happen to think or believe about the mind, the body, and awareness … as much as possible, forget about it, at least temporarily. Let yourself be unsettled by these questions. And in each moment of our practice, just try to see what is happening. Look at all this as a kind of experiment. Observe carefully, without judgment, and without leaving anything out, whatever it is that you are experiencing. If we do this, we can’t go wrong.